The Thai island of Phuket is preparing for an influx of visitors in July, as more than 500 sailors and spectators from around the world head to the Island to compete in the prestigious Cape Panwa Hotel Phuket Raceweek 2015, set to take place the 15th to 19th of July off Phuket's southeast coast. Now in its 12th year, Phuket Raceweek's reputation overseas continues to grow as an increasing number of participants from all over the world fly in to take part and enjoy the beauty of Phuket's Green Season. "We are very pleased to see more international participants taking part in Phuket Raceweek each year. There is a large local fleet of boats for charter in Phuket and nearby, and as word continues to spread about Phuket's stunning sailing grounds and Phuket Raceweek, we expect to see continued growth in the number of overseas sailors taking part," said Mr. Byron Jones, Managing Director of organisers Media Business Services Co. Ltd. (MBS). Equally important to overseas participants is the regatta shore venue and with the five-star Cape Panwa Hotel as title sponsor and host venue together with sister property Kantary Bay Hotel, Phuket Raceweek provides an idyllic beachfront venue and safe anchorage with onshore service second-to-none. "Cape Panwa Hotel is an excellent host of Phuket Raceweek. With direct beachfront access sailors can anchor metres off in safety and enjoy the Regatta Village and social activities which are in the hotel's gardens. The service is five-star, the parties are second-to-none and this has helped Raceweek win awards and set a new regatta standard," added Jones. Cape Panwa Hotel Phuket Raceweek 2015 is set to attract more than 500 sailors and spectators to Phuket between 15th and 19th July. Further underscoring their commitment to Cape Panwa Hotel Phuket Raceweek, this year will see Mr. Tirapongse Pangsrivongse, owner and CEO of the hotel's owning group Cape & Kantary Hotels, competing on his newly acquired 12.8-metre boat, Kantus' Bride. "All of us at Cape Panwa Hotel are excited about Raceweek. It is truly a privilege to host such a prestigious event, and have an opportunity to meet such talented and driven sailors from around the globe. We can only hope that all of our guests enjoy our numerous restaurants, our secluded beach that is calm year round, and the lively parties that will be held during this year’s regatta. I have a personal stake in this year’s regatta, as I will participate on board my own yacht. I look forward to a spirited race, and may the best crew win," said Mr. Tirapongse Pangsrivongse. Phuket's strategic central position and yachting hub status in Asia, combined with being home to some of the besthelped Raceweek win awards and set a new regatta standard, sailing grounds in the world – and the idyllic host venue of Cape Panwa Hotel - prime the event for further growth. Often perceived as a niche sport, regattas in Thailand attract between 300 and 2,000 sailors and spectators to a destination for a week or longer, delivering revenue directly into the local economy through spend on accommodation, food and beverages, and entertainment. Cape Panwa Hotel Phuket Raceweek is the opening event of the 2015/16 AsianYachting Grand Prix – a regional sailing championship that includes twelve of the best regattas in Asia. 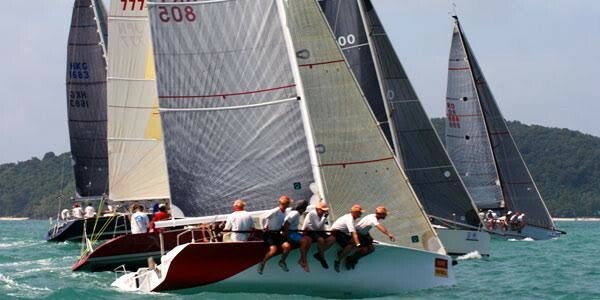 Organized by Media Business Services, the regatta consists of four days of world-class racing from 15th to 19th July off Phuket's southeast coast.